Friday I attended a quilt show in the "Big City" as Mr. Squash and I like to say. It's the closest large city from where we live and about 50 miles from home. I went with my friend Tammy whom I met blogging. Tammy also lives in the big city. We had a great time! Here is Tammy with her entry in the show. It's an adorable house quilt which combines patchwork, needle turn applique, hand embroidery and lots of love! The theme of the show was "A Quilter's Journey" and Tammy's quilt very much fit the bill. Each house has some significance and even her pets are featured! Great job, Tammy! I took a lot of photos but whittled them down to just a few for your viewing enjoyment! Isn't this one a stunner? I thought this one had an interesting use of color that really works! This one is by Eddie Walker, a local artist, who prior to quilting and designing her own patterns was well known as a figurine artist! This quilt is called Wedding Ring...Ring and is based on her pickle dish design. I thought this was an interesting Dresden variation. Quilters who do landscape quilts always fascinate me. Look how this one is so close to the actual photo! This quilt was made in the 1890's. I was blown over on how bright the colors have remained! Click on the photo to enlarge this crazy quilt made in 1912, which contains pieces from one of Mrs. Lincoln's dresses. Of course I couldn't leave you today without a couple of cute kitty photos! Sasha likes to sit next to me at the computer every afternoon. She was so happy and relaxed here that her little tongue peeked out! 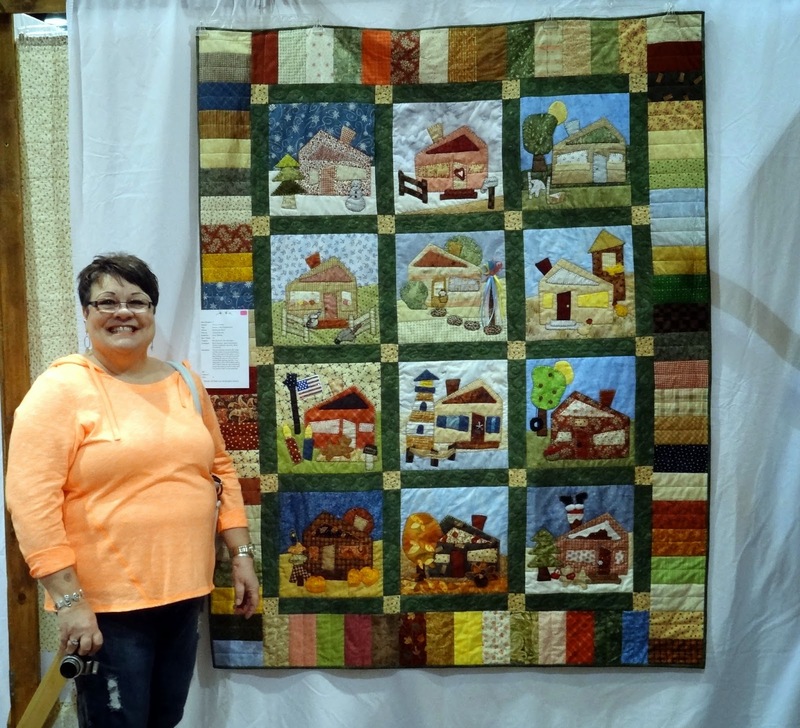 Thank you so much for sharing the quiltshow pics..
Tammy did a wonderful job. You have quite the talent in your area. That antique quilt is amazing and looked new. I love that sort of pea green color. Crazy quilts are so fascinating and the hand work, amazing. The girls obviously appreciate quilts and blankies too. Nothing like a good quilt show, and this looks like a good one! Beautiful quilts! Your kitties are adorable, as always - and I love the quilt that Gracie is "hiding" under - too cute! Oh I love that picture of Sasha and her little tongue sticking out. That is so adorable and Gracie playing hide and seek under the quilt is way to cute too. Kitties just have so much personality. Oh and Madison says you can come back and rub her tummy anytime Aunt Candace!! Hugs. Awesome show and tell and awesome kitty pics. You'd think they were sisters from the same littler. I would love to see and touch that crazy quilt in person. I think that's one of the nicest ones I've "seen". I too am amazed at the condition of the antique one, especially the colors. Isn't the quilting awesome? Thank you for sharing all those beautiful and inspiring quilt photo's! I think Tammy's quilt is terrific - love all those personal/sentimental details she added to the design work. Very cute kitties - I enjoy seeing pictures of cats & quilts. A perfect combination of happiness. Looks like a great quilt show display. I don't know why, but I am drawn to the gray and white quilt. I love the Quilter's Journey quilt, beautiful work. And of course, I love the second one, too; beautiful use of reds!! I had not realized Eddie Walker was no longer doing the figurines but is now quilting. I have some of the figurines and have loved her work! What a lovely show that must have been!! I like that dresden plate variation. So nice to "see" Tammy and her very special quilt. Thanks for sharing Candace! Give the girls a pet from me. Your friend made a gorgeous quilt! I also really like the second one. Thanks for the show! I love seeing pics from quilt shows. All that talent! Plus..people using colours that I would never dream of using. Tks for sharing with us. Those quilts are amazing! What wonderful talent the quilters have. OOO! great quilt show. I am amazed at those that do landscape quilts too. One day I would like to attmept one. Love that pink tongue peeking out. Thank you for the beautiful quilt pictures. I just posted a few pictures from my own local show. I love looking at quilter's color and pattern interpretations.